Christmas Tree need not be boring green all the time. This Christmas try something different and decorate your house with a variety of Glitter Christmas Tree. Do you need ideas? Well, scroll down and pick your favourite. 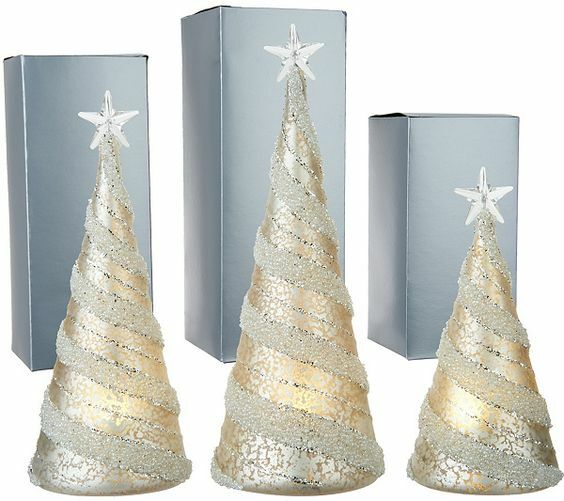 Sequin gold Christmas tree looks extremely captivating and beautiful for decoration. This can be made from simple paper cones covered in sequin gold and decorated with other ornaments like bows and ribbons. 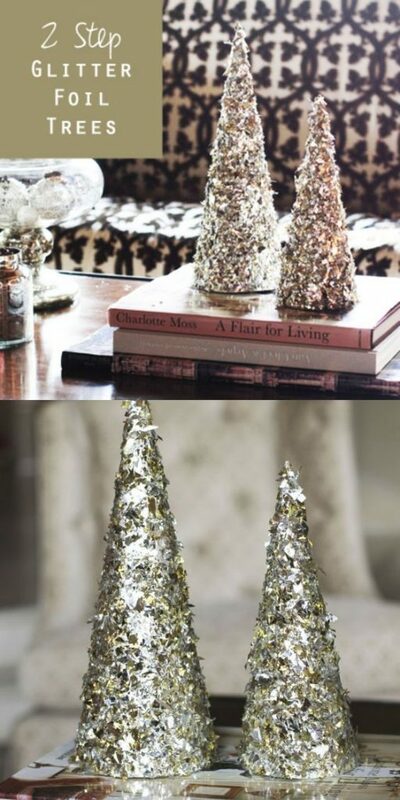 Silver and sequin Christmas trees are equally alluring like the gold ones. And when you adorn them with yellow fairy lights, it emits a beautiful glow and looks charming. It is not entirely necessary that the Christmas tree requires to be smeared with glitter. For decoration purposes, add white, long feathers with silver and golden glitters as faux snow. Hang them onto the branches and decorate with fairy lights. It is extremely easy to make a Christmas tree with ice cream sticks. Take a vertical long stick and stick the smaller pieces horizontally to make it look like a Christmas tree. Stick small glitter beads followed by a shimmering star on top. What can be more beautiful than glitter? Well, it is glitter foil. On the cone, coated with the good layer of mod podge—stick the glitter foils to give an ultra glamorous look to your embellishment. 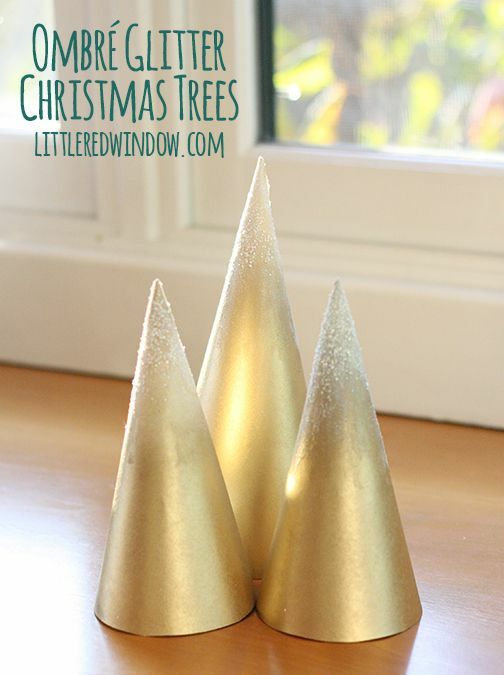 The look of glitter and sequin Christmas tree cones is simple and amazing. Most importantly, they are extremely easy to make. On a plastic cone, daub glue and wrap different woollen thread all around it in a criss-cross manner. Add Glitter and sequins to make it look stunning. Once the glue dries after 24 hours, take off the plastic cone and your decorative Christmas tree is ready. Red is the color of Christmas and you can also make small red glitter Christmas tree for the table and interior decoration. Take a cardboard cone of your desired size, and coated with glue generously. 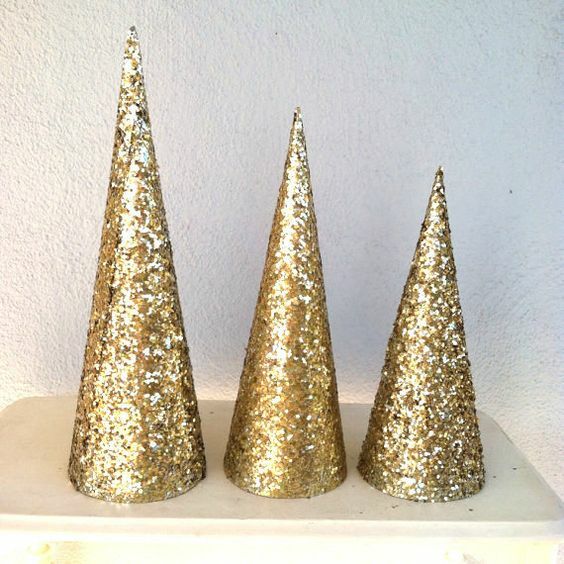 Dip them in red glitter to cover the whole cone and let it dry for a few hours. And your 5 minutes red glitter Christmas tree is ready. The blue glitter Christmas tree can be made from bottle cleaning wires in cone-shaped. You can also spray paint them in different colors as you like. Use a sturdy base and cover it with glitter glue. You can also add glitter layers in between the branches. Pretty pink glitter Christmas tree is as beautiful as it gets. 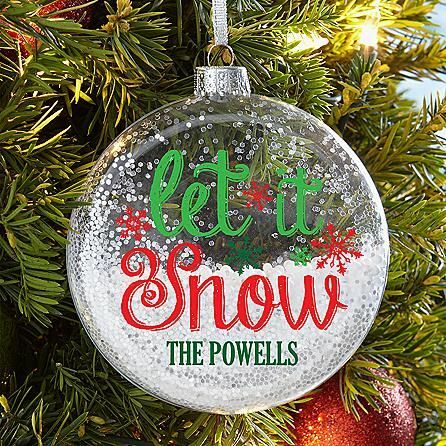 The generous amount of pearl silver beads and artificial snow makes it look enchanting and beautiful. Glitter and ombre make a gorgeous combination for Christmas tree decoration. 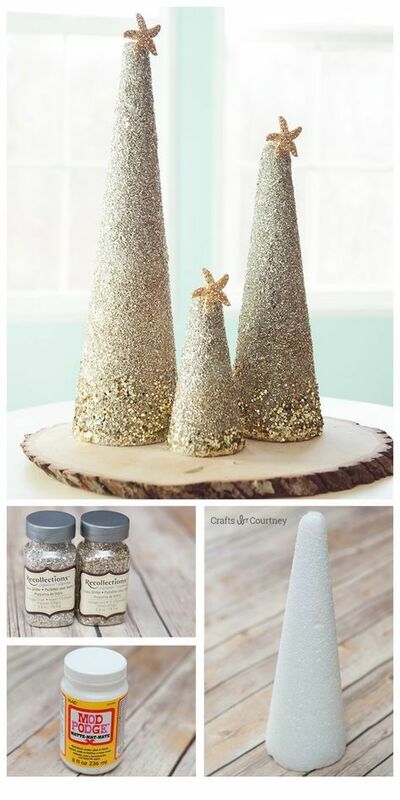 Use golden cones and paint the top with silver or white glitter and decorate with stars and ribbons to make it look absolutely stunning and beautiful. 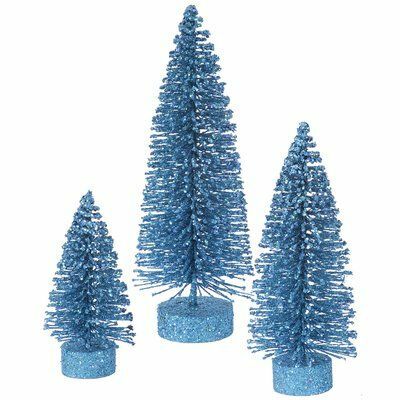 Ice glitter trees look beautiful as a table decoration and also all around Christmas trees. You can make it with dual purple color topped with silver foil glitter on top. They look enchanting and have a beautiful appeal to it. 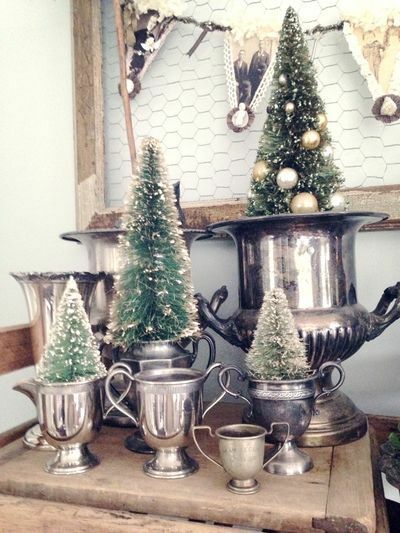 Glitter and pearl silver setting for Christmas barn, Christmas tree and wreath looks alluring for interior decoration. Paint the branches of the trees with silver glitter as well as the reindeer and other accessories. Decorate with small and large shiny pearls to add a glamorous touch to it. Ombre can be of two or more colors but silver and gold ombre beat all of them. To make this, take a foam cone and coat it nicely with mod podge. First, cover the layer with silver glitter and towards the end coat, it with gold chunky glitter foil and blend them. Decorate it with a golden star on top. Delightful Christmas would be having some sparkle and glittery Christmas tree. 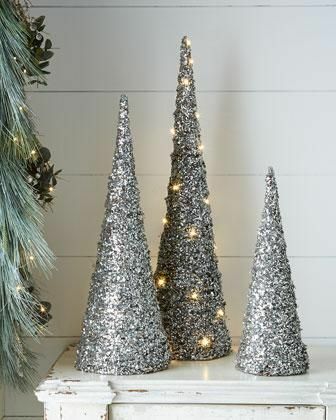 To make tinsel glitter tree, take a cardboard or metal cone and smear with super glue. 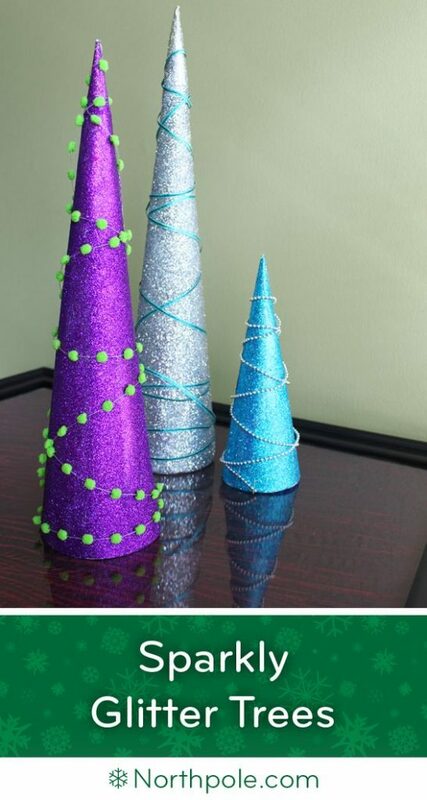 Before the glue dries, wrap colourful glittery tinsel strips all around the cone and let it dry. Glitter stripes and starred trees are more beautiful than regular ones. To make this, take different metallic cone-shaped structures and spray paint them in deep red. Once the paint dries, make circular patterns all around the cone. For additional touches, add small studs in alternative lines and place a glittery star on top. Instead of buying a glitter Christmas tree have all the ornaments painted in glitter and sparkles. Decorate the tree in such a fashion that the whole structure looks like covered in sparkling materials. You can paint the green branches in silver glitter. 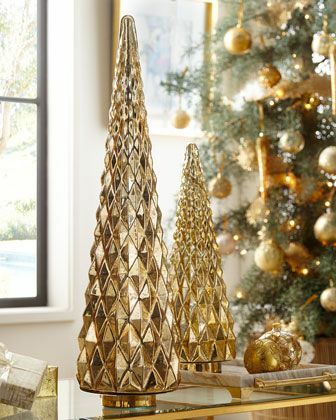 These are golden striped Christmas tree made with Mercury glass and LED lights. The whole structure is embellished with glitter and topped by a star and it adds a beautiful ambiance to the holiday decor. Blue and purple together looks enchanting and magical and hence it can be used for Christmas tree color. 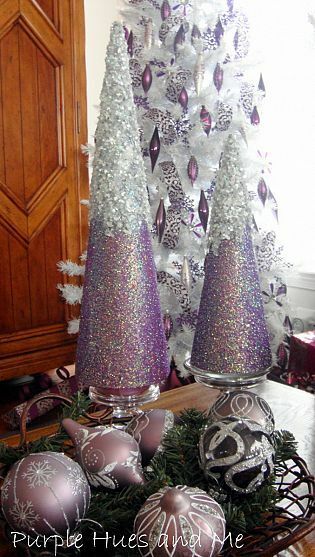 Cover a cone shaped tree in glitter purple color (you can mix pink or silver in it too) and layer the conical top with turquoise bluish glitter and blend them. We have already seen Christmas tree of various colours and blend but a complete ornamental tree with studs and jewellery piece looks lovely and fascinating. It can be used a table and mantel decorations. The shinning and glittering mercury glass hobnails can be used to decorate the Christmas trees. To DIY this, take a conical shaped metal and with the help of super-glue stick the golden mercury glass hobnails to cover the entire body. With the help of plastic cone, mod podge and woollen thread dusted with glitter powder, make the shape of a Christmas tree. Once it is dried and ready, wrap the tiny fairy lights all around it for decoration. 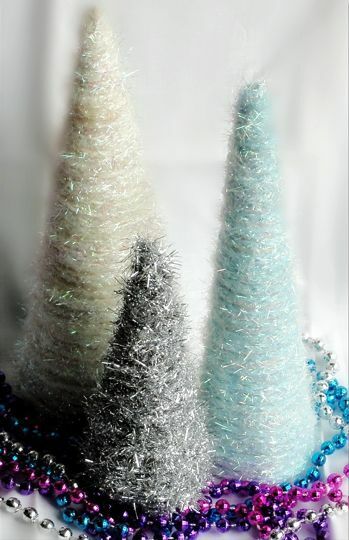 Multi-colored Glitter Trees are easy to make with different glitter color all over the cone. To make it look outstanding, use small-beaded pearl strings, thin tinsel strips wrapped all over the length of the Christmas tree. These are made from bottle brush, faux snow, champagne or gold tinsel glitter, Fabric scraps and lastly glues to adhere them all to the structure. You can also use Jewellery pieces for decorating. 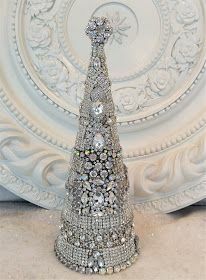 These are custimized small Christmas tree where you can easily paint the silver glitter or simply sprinkle them on top to make it look like glistening snow and decorate with pearls. 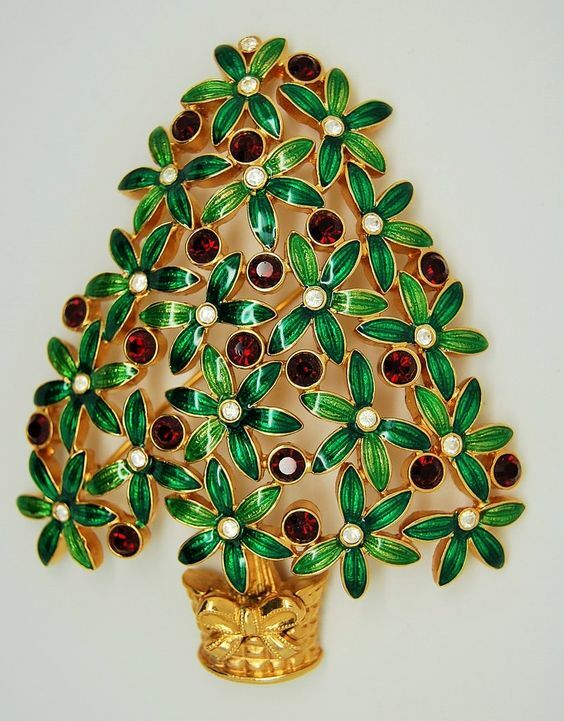 With the help of super glue, stick all your vintage brooches on a metal tree and make it look all glamorous and breathtaking. 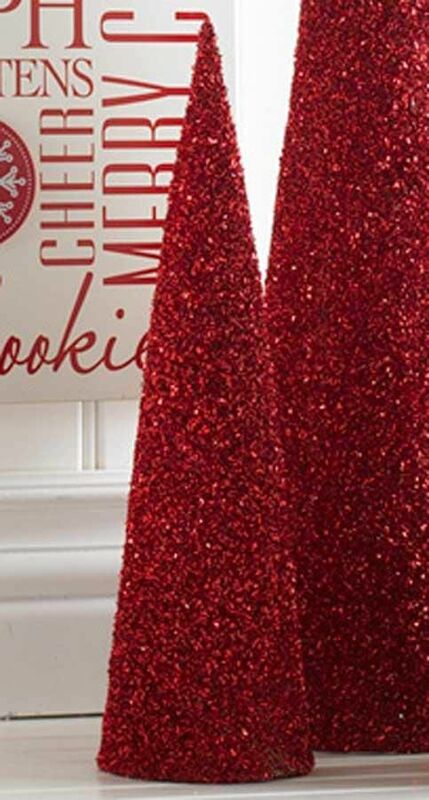 These are some amazing glitter Christmas tree ideas and which one would be your favourite?